Not everyone is, or can be a thought leader, major influencer or a big personality. But everyone can be market relevant, build personal brand authority and be the best version of themselves. Similarly all in professional and service based business can build visibility and credibility as a subject matter expert in their field. Standing out, owning your value, genius and power is available to all. But it has to be the real deal, not fabricated fluff or smoke and mirrors. There is a lot of hype under the covers swirling that you must sit on a pedestal of self grandeur and hoopla which is nonsense. We observe this zeal on social media which is mostly counter-productive to authentically communicate and leverage a personal brand. And there is much confusion about what constitutes a thought leader. A thought leader is not always a leader (and not always mutually exclusive). Thought leadership is defined as being truly innovative, creating and holding unique solutions, ideas and concepts. Influencer branding can also be different to being influential and having influence. We all influence in some way shape or form – be it at micro or macro levels. The notion that everyone has to be a powerful influencer with 10,000+ followers is illogical. Thriving in business is challenging and even more so since the internet revolution. We are drowning in content, digital overwhelm and an ocean of choices. Grabbing a solid chunk of our sector’s $$ pie is both harder and easier than ever before. ‘No one does exactly what you do in the exact same way you do it”. “If you want to grow your brand, you’ve got to come to terms with power — your own. The key lesson: power is not a dirty word! In fact, power for the most part is a badly misunderstood term and a badly misused capability. I’m talking about a different kind of power than we usually refer to. 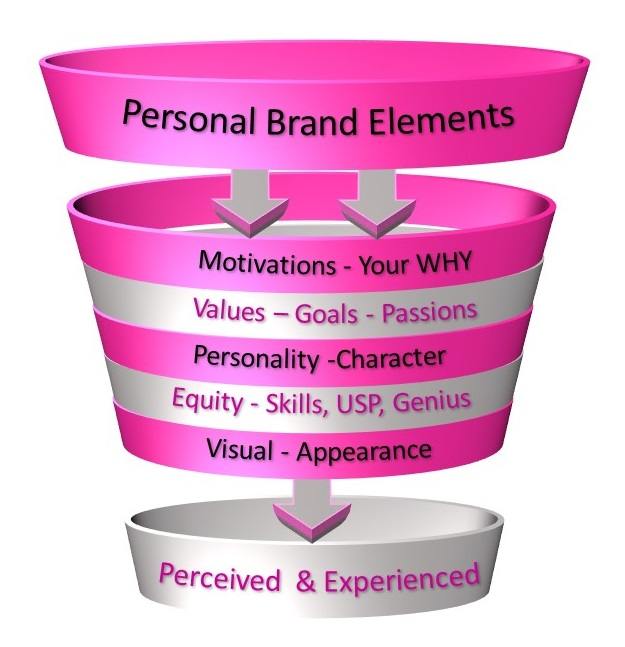 In essence personal branding has been in existence for eternity. Even back in the horse and cart days, people dealt with those they Knew, Liked & Trusted. We all have a personal brand. School teachers, tradespeople, CEOs, university students, store managers, TV celebrities etc – no one is exempt. Perception and experiences of that brand can be negative, neutral or positive. And those perceptions have a long bow based on many factors. We cannot be everything to everyone and we won’t resonate with all – and that’s ok.
My favourite business mantra is ‘Your Vibe Attracts Your Tribe’. Embracing that ethos reduces stress, empowers confidence and guides positioning your value. Getting in touch with your own Vibe though starts with self-awareness, mirror work and a bucket of courage. After all you want to be a powerful magnet to your ideal clients. Your Motivations, Values, Personality, Equity and Visuals are displayed and woven into all written, media and verbal communications. And ultimately you must check what other people say about you. Doing this may uncover a few ‘ouch’ moments if there is a disconnect between rhetoric and reality. And those unique nuggets hold the key to your brand differentiation. And it’s that differentiation that needs to be powerfully communicated in a way that is authentic to you in an engaging and real manner. Storytelling has a big part to play there also. An extra aspect around your Values-Goals-Passions is to reflect on the clients you do and do not want to attract. Who and what brings you joy and satisfaction is equally important as who doesn’t. Getting clear here gives an edge in your communications that instinctively repels those who you don’t wish to attract and draws more of those you do. We are not perfect humans and sometimes we can go off brand. But we need to strive for a 90% consistency rate. 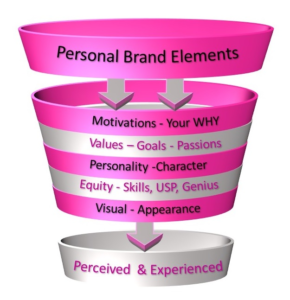 Overall, the personal brand promise will benefit business enormously in attracting and retaining loyal aligned clients. 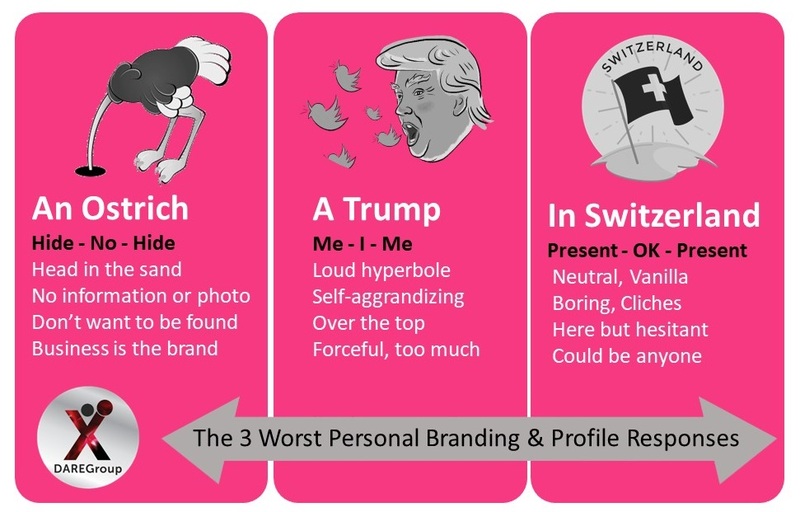 A great personal brand will maximise ROI of all social media, digital and marketing activities and spend. Be daring and hold your unique value without fear, Build your personal brand authority and step out as the authentic and best version of Brand YOU in your sector.